In anticipation of Sunday's expected gathering of white nationalists in D.C., area leaders are trying to give counterprotesters advice about how best to respond to bigoted groups. WASHINGTON — In anticipation of Sunday’s expected gathering of white nationalists in D.C., area leaders are trying to give counterprotesters advice about how best to respond to bigoted groups. “There are constructive and productive ways to respond to hate,” House Del. Eleanor Holmes Norton, D-D.C., said. 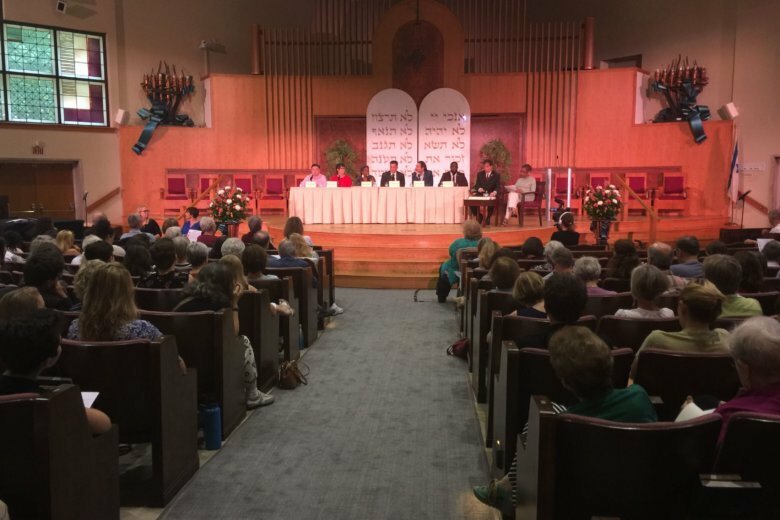 Norton was among local leaders and community members who gathered Friday at Washington Hebrew Congregation to explore different responses to the “Unite the Right 2” rally. But for those who are planning to attend events in D.C. on Sunday, the Anti-Defamation League and Jewish Community Relations Council recommended putting as much distance as possible between protesters and counterprotesters. “Safety should be the number one priority,” the groups advised. People are being encouraged not to provoke or confront members of the “Unite the Right 2” event. “But to create an alternative message of diversity, of love, of inclusion, of resilience, of hope — and I really believe that we can do that together,” said Aaron Alexander, co-senior rabbi at Adas Israel Congregation. Alexander said it’s understandable that some people might feel anxiety and frustration with the messages of hate that are being brought to the city. So, what does someone do when their visceral response might be to stand toe-to-toe with an adversary, get in their face and yell at them? Alexander noted that there will be a number of counterprotests planned in D.C. for Sunday, where people can embrace and display feelings of inclusion and tolerance. “That will be with people who don’t look like you, who may not live exactly the same lives as you, but who share a similar value,” Alexander said, adding that a number of faith groups will be on the National Mall on Sunday for a United to Love event. The National Park Service has issued permits for a number of events Sunday: the DC United Against Hate rally takes place on Freedom Plaza, and Black Lives Matter of Greater New York will be at the Martin Luther King Jr. Memorial. The ANSWER Coalition and Partnership for Civil Justice will be gathering in the areas of Lafayette Square, Farragut Square and McPherson Square.